The Office Of The District Judge Uttar Dinajpur At Raiganj, West Bengal, Is Recruiting 43 Eligible Candidates In The Following Posts - Stenographer, Peon, Process Servers, Farash, Night Guard And LDC. So Interested Candidates Can Apply For This Job Within The Last Date. 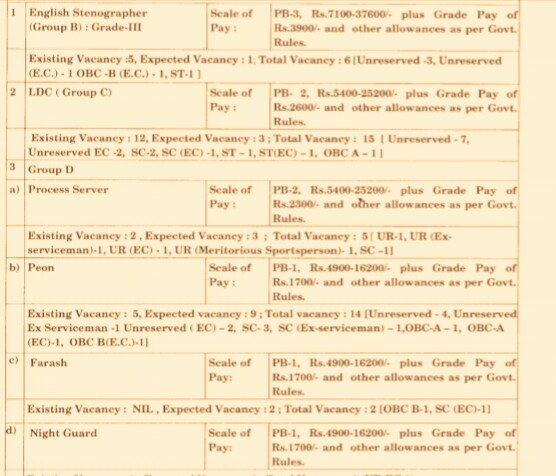 Various Vacancies (Kindly Check Out The Image Below For Details) →43 Various Vacancies. B. Eligible Criteria For This Job Of Uttar Dinajpur District Court, Raiganj 2019. Age Limit →18 To 40 Years, Age Relaxation Is There For Reserved Candidates. Educational Qualifications →Certificates In Concern Discipline From Certified Board/University. Mode Of Examination/Selection Process →Candidates Have To Undergo Through These Selection Process Screening Test, Dictation & Transcription Test, Typing Test, Written Examination, Personality Test And Computer Skills Test (Post Wise). Online Application/Examination Fee →For English Stenographer ₹400 (For ST/SC ₹300), Lower Division Clerk ₹350 (₹250 For ST/SC), And For Other Rest Posts ₹250 (₹200 For ST/SC), Online Payment Mode. Last Date For Online Application Form →15th Of February, 2019. For More Information →Visit The Official Website For More Details On Admit Card Download, Results And More,Link Is Given Here >The Official Website Of District Court,Uttar Dinajpur, West Bengal. Apply For 20 House Staffs (Junior Resident)In Raiganj, Uttar Dinajpur Recruitment 2019 In Raiganj Government Medical College & Hospital. How To Apply→Raiganj Government Medical College & Hospital invites application for the post of House Staffs (Junior Resident) of one year. M.B.B.S. Graduate from recognised Medical College (approved by MCl, Govt. of lndia) is eligible to apply through Walk in lnterview. Candidate must be bring all the original documents like Educational Qualification (MBBS certificate, Registration Certificate), Proof of Age, etc and oneself attested copy of all Educational Qualification Certificate at the time of walk in lnterview. The lnterview will happen on 08,03.2019 at the chamber of Principal, Raiganj District Hospital, at 1 1 .00 am. fhe remuneration is applicable as per W.B. Rules (ROPA ,98).The application must be sent to mai I :-prin raiqan iq mch @q mail.com with in 07.03.20 1 g, Check Out The Image Below For Vacancies Distribution, Educational Qualifications, Age Limit, Date Walkin Interview And Venue. (Credit- The Official Advertisement Memo No. RMCH/124 ). Now Apply For 20 House Staffs Walkin VacanciesVacancies In Raiganj Uttar Dinajpur, West Bengal 2019. Click Here To Download Both Official Offline Application Form/Notification Of House Staffs Jobs In Raiganj, Uttar Dinajpur. Thank You For Your Visit And Do Regularly Visit Here For More Information On Jobs In Uttar Dinajpur, Job In West Bengal And More, Till Then Stay Safe And Blessed.